The factory of Horizon Sources SL is based in Spain Barcelona 15 minutes from the international airport. Our 15 year-old experience in the manufacturing and distribution of Imprinted promotional products strengthens our ability to present you really original new products. Our products are sold world wide through a strong and reliable network of profesionnal distributors. Horizonsources is part of the Horizon Group. With divisions and companies in several countries the group is a reference for quality and service in the premium and gift industry. Logosocks : Producer of socks with logos. On this page you can see a few examples of companies using succesfully the freshballs and the aromatic car air freshener for their promotion. AVIS, placed a freshball in each hired car. apart from brand awareness the car air freshener perfumed the car for the new user. Many clients even took the Ringball with them after returning the car. In Corsica a chain of souvenir shop sells succesfully the Freshballs with the emblem of Corsica. Tourists are happy to keep a souvenir of their holidays in their car. A german chain of hotels BEST & WESTERN, gave a freshball with the Hotels logo to each leaving guest. As the freshball stays for weeks in his car, the client gets used to the brand and will, while traveling, recognise the brand along the road. A large car battery producer in France gave an air freshener with each replace battery. The Clipball showed a small photo and the brand of the Battery. 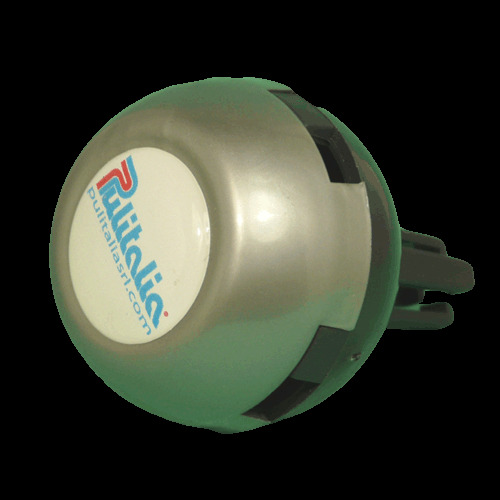 This shows that the freshball is the promotional item for spareparts, oil and lubrication companies. Instead of being hidden in the motor of the car the brand is centraly placed in the cabin. Stickballs as Tool for office workers. An insurrance company in Greece gave a Stickball to each of its employes with the new help desk phonenumber printed on top. Apart from diffusing a nice perfum around the workers desk the Stickball diffused usefull information to the worker. For established customers samples are either no charge or memo billed. For non established customers samples are billed. We’ll be happy to supply samples of any of our specialty advertising & promotional products which interest you. Cost, including shipping, handling and taxes (and duties if applicable) is payable before sample order is processed. Should you decide to place an order the cost of the sample will be deducted from the cost of the order. If you do not decide to place the order, the sample will be considered to be purchased and no refund will be issued. Samples under 10 euros are non returnable. Samples over 10 euros in cost may be returned up to 25 days after initial shipping of those samples however a factory return authorization is required. If you do not hold an account with us (if you have not done business with us before) then samples must be prepaid before dispatch. Please be aware that all samples are charged at their minimum quantity price and carriage will be extra. If a sample is returned on time (where applicable) the only charge is carriage. If a sample is not returned on time (where applicable), the client involved shall be invoiced for the product. Returned samples must be in an unmarked condition. Samples can be customized to suit a client's needs, colours or logos, but this will invariably be incur customization charges at the manufacturer's own rate and discretion.